Okay. Its now an obsession. Molten Lava Cakes. AKA the best cake known to mankind. Once you cut into it, the melted insides just pool out into a sea of deliciousness and is infused in each and every bite. After making the original chocolate one, I knew a white chocolate one had to make its debut and today is that day. Believe me. This is absolutely DIVINE! 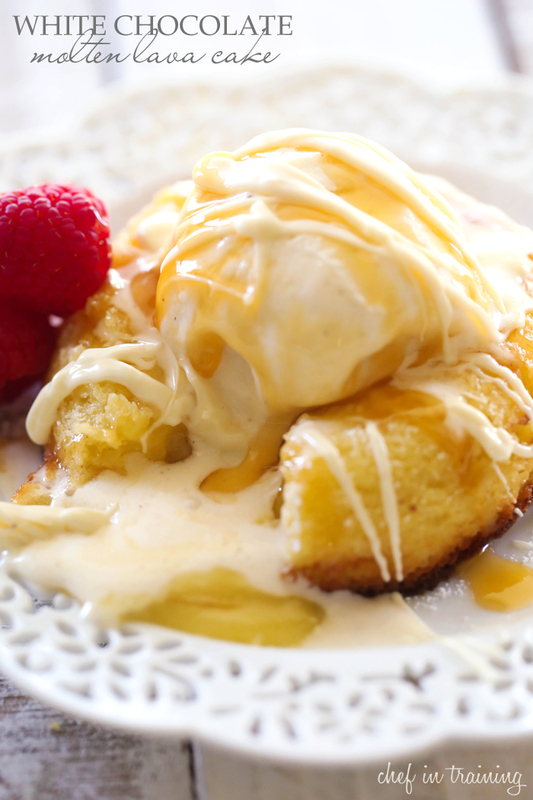 If you love white chocolate, you are going to LOVE this recipe! This cake is truly AMAZING! It is infused with melted goodness in each and every bite. It is beyond heavenly! Spray 3-4 small (6-8 oz) ramekin dishes with cooking spray and place on a baking sheet. Set aside. In a small microwave safe bowl, combine butter and chocolate and melt in 30 second increments, string between each increment until chocolate and butter are combined and smooth. Add powdered sugar and stir in evenly. Add eggs and egg yolks and beat in until well combined. Pour and distribute batter evenly in the prepared ramekin dishes. Bake at 425 degrees F for 11 to 13 minutes until edges are firm and center is soft, but not super jiggly. Let cool for 2 minutes. 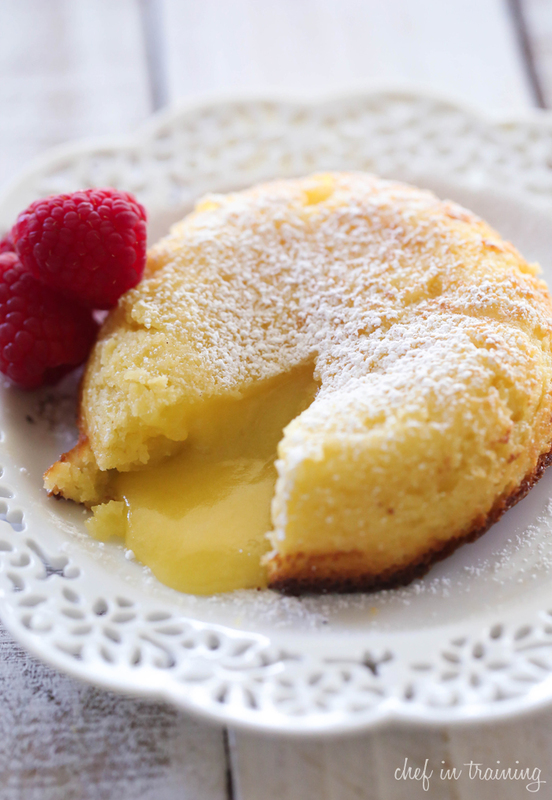 Using a knife, gently pull cake away from the edges then invert onto plate or serving dish. Serve with dusted powdered sugar, ice cream, magic shell or however desired. No matter how you want to eat it, serve immediately. I loooooooooove white chocolate and I just have to make it. I've been meaning to try my hand at a white chocolate molten lava cake as I adore white chocolate but worried it would be too sweet. Now I gotta try it for sure! I've made molten lava chocolate cake many times. There a great dessert,that's easy to make but looks like you've slaved all day! These white chocolate versions look absolutely delicious ! Can't wait to try them. Thank you for sharing. I made this for my wife on Valentine's Day. This is so easy and elegant! I think it is the perfect dessert! I would also like to know if you can make a day ahead and then how to store. I am new to your site and I am really enjoying it!